BMC (Austin, Morris etc) car accessories of the 1960s. Homepage. 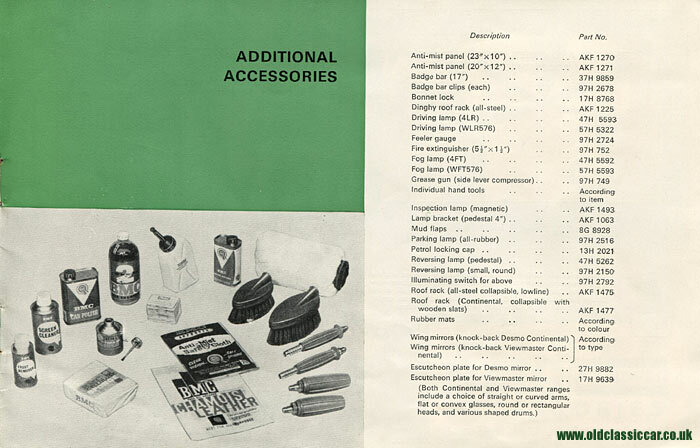 This page: Original factory literature describe the dazzling array of accessories that were available from your BMC agent. 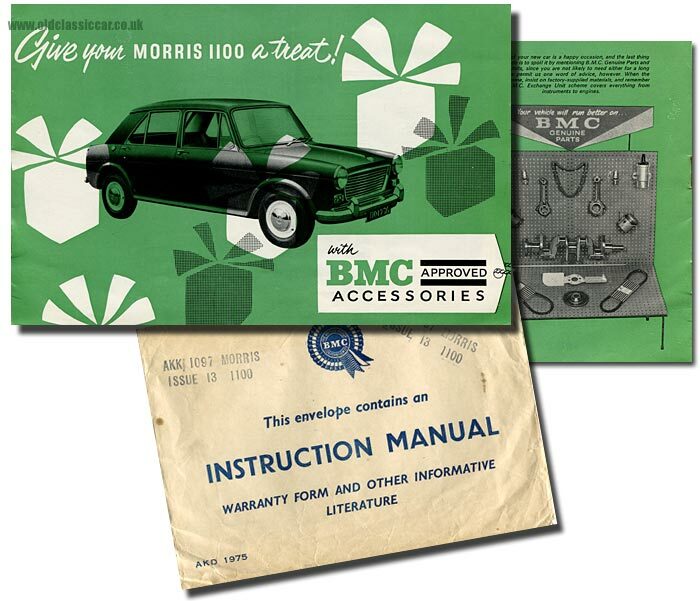 Approved BMC Accessories for your Morris 1100. 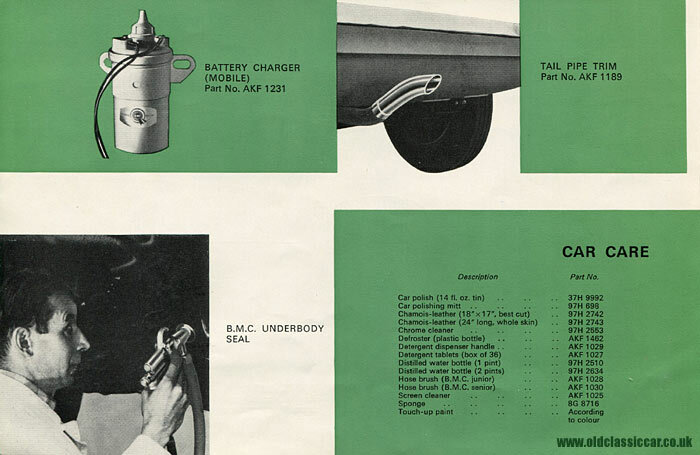 A couple of leaflets turned up recently describing optional extras that were available to buyers of BMC-built cars in the mid-1960s. Therefore it seemed like high time to start a page looking at the choices that Sir or Madam had, when upgrading their Austin, Morris, Wolseley or other car from the BMC stable. Given how numerous these cars were, I'm sure that plenty of people wanted to make their motor stand out a little from the masses. 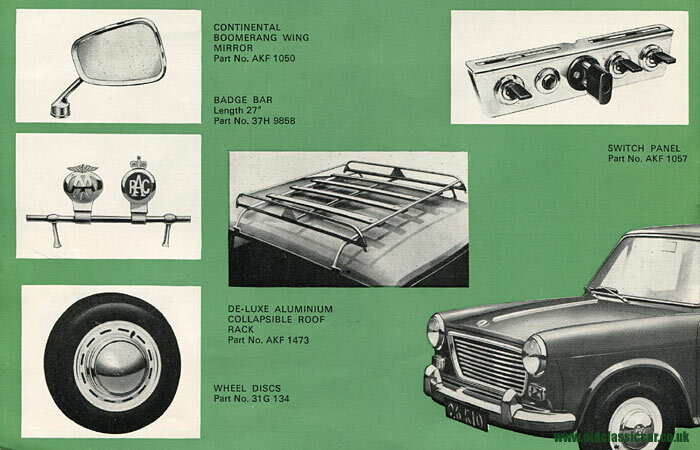 The first leaflet is specific to the Morris 1100, although presumably the equivalent leaflet for the Austin 1100 wouldn't have looked much different, if at all, given that the more common ADO16 variants weren't overly-blessed with gadgets and racey accessories (a head-on view of a totally standard Morris can also be found on this page). "Give your Morris 1100 a treat!" 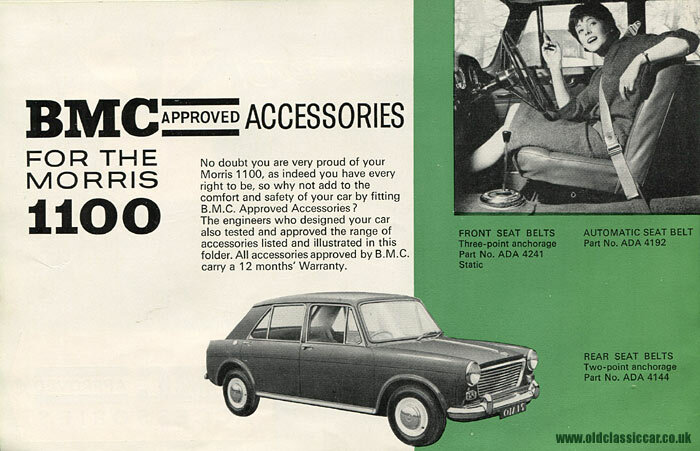 the Morris driver is urged, "with BMC Approved Accessories". Curiously the cover of publication ref. AKD 2075 features an illustration of a bog-standard example, with no accessories in sight. It is dated December 1964. The rear cover does include a photograph of a display stand, but features a number of BMC replacement parts rather than accessories, which after all are the subject of the leaflet. Still, the contents within make up for this. I also found the original envelope in which the owner's handbook, and these accessory guides, were originally presented in 1965. No doubt you are very proud of your Morris 1100, as indeed you have every right to be, so why not add to the comfort and safety of your car by fitting BMC Approved Accessories? The engineers who designed your car also tested and approved the range of accessories listed and illustrated in this folder. All accessories approved by BMC carry a 12 months' Warranty. Safety was the first subject to be put under the spotlight on turning to page one. A young gal sits behind the wheel of what looks like an A60 (or version of), demonstrating a three-point front seatbelt (part ADA 4241). This was the static version, for the automatic (inertia reel) type you had to ask for ADA 4192. On the facing page there are photographs of automatic and rear seatbelt installations, in addition to three lighting upgrades that your faithful and trusted Morris sales agent could supply one with. 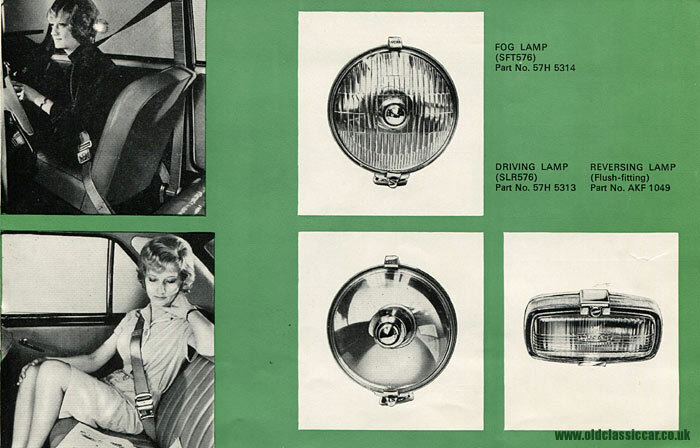 Business motorists, and others who regularly had to travel in all weathers (as did my grandfather I believe, in just such a Morris in 1965) might well have found the combination of a Lucas SFT576 fog lamp, and SLR576 spot lamp, to be a jolly worthwhile investment. The under-dash switch panel, shown later on, would also be needed if these lamps were specified. Also shown is a flush-fitting reversing lamp, standard fare on modern cars but far from common on small-medium cars of the day. Even wing mirrors were an extra-cost option in this segment of the market. The following page lists part number AKF 1050, a "Boomerang" wing mirror with "Continental" type head. Members of motoring organisations such as the AA or RAC, or possibly a local car club, may well have been tempted to fit a badge bar, while tradesmen and those with families could easily have seen the opportunities presented to them by the fitment of a roof rack, especially as the 1100's boot wasn't that large. In contrast, polished aluminium wheel discs didn't serve much purpose but did brighten up the side view of these best-selling British cars. Heated seats were the stuff of dreams for the average 1960's motoring enthusiast in Britain. Cold vinyl seats, on a chilly morning, aren't all that pleasant to perch one's backside upon, so seat covers, in an attractive range of colours, were available for a few £. Unfortunately as this isn't a full-colour publication, the example illustrated - and the travel rug below it - aren't terribly eye-catching. 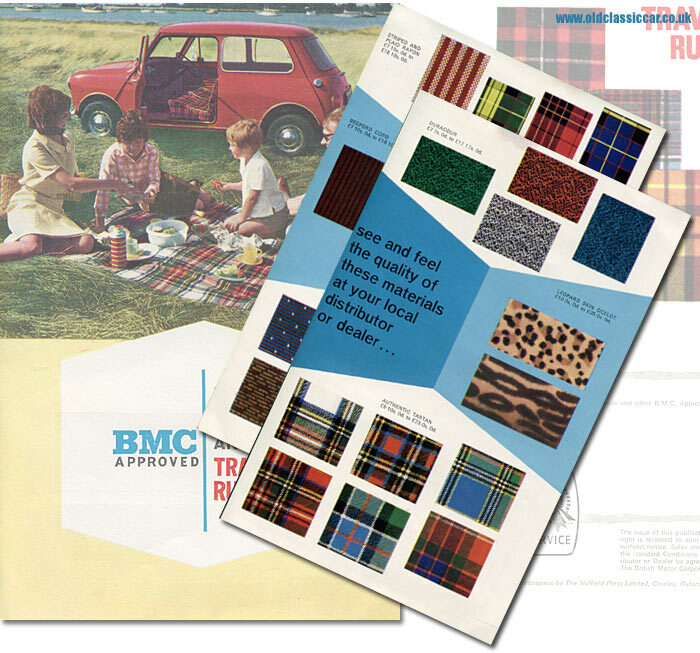 However, mindful of this perhaps, BMC did produce a full-colour leaflet describing both seat covers and travel rugs in much better detail. A copy of said item can be found further down this page. The reader is also shown AVA 293, the electrically-heated rear window, a boon in winter and a good test of any car's dynamo! The next item I don't think I've come across an example of before (although I've seen plenty of chrome exhaust trims). The Battery Charger (mobile), AKF 1231, looks more like an ignition coil than a charger. Does anyone have a photo of just such a gizmo in service? This page also refers to one upgrade that no ADO16 buyer should ever have skipped - the "BMC Underbody Seal". While the 1100 was quite an advanced design for its day, as with so many cars of its era, the bodywork could crumble away in an alarmingly short period of time, and many's the car magazine in the 1960s that has letter after letter from despondent owners, keen to find economical ways of fixing their corroding cars, and if possible deter the ravages of corrosion for as long as possible, even on cars of comparatively tender years. If every ADO16 owner had opted for a proper underbody anti-corrosion treatment, just think how many more Austins, MGs, Rileys and Vanden Plas 1100s there'd be zipping around. A number of other car care products are listed. 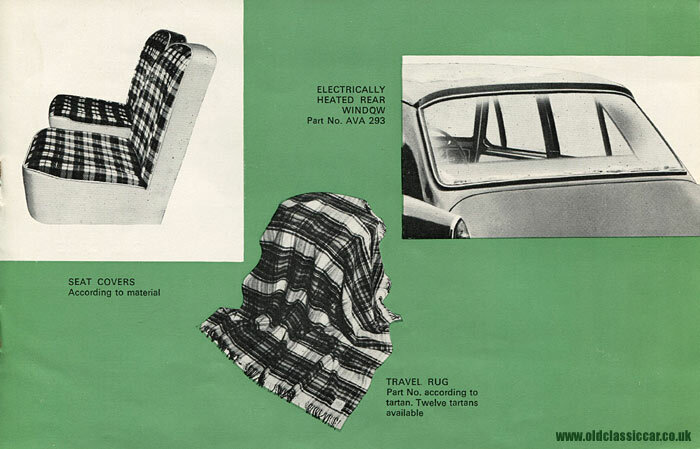 Seat covers and travel rugs. The range of seat cover designs was even more impressive, with all manner of multi-coloured designs available to protect and brighten up your car's interior. Various designs in moquette, striped and plaid rayon were available, while for the daring and those of less mainstream tastes perhaps there was the option of "Leopard Skin Ocelot" - groovy. Coincidentally, on the site forum a few years ago, a thread was started on the subject of BMC aftermarket accessories, and an example of a travel rug can be seen along with other interesting oddments - read the thread by clicking here. To read more about various accessories, tools and gadgets that were put on sale in years gone by, please check out the gadgets and accessories section of the site.